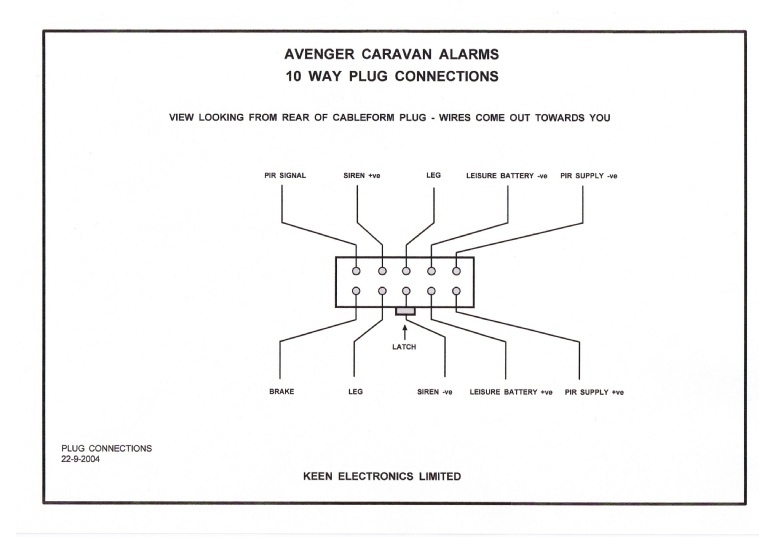 Avenger alarms are only supplied to caravan manufacturers for factory fitment. These instructions and the wiring diagram are to assist dealer's service technicians. NOTE THAT THE PP3 BATTERY IN THE CONTROL BOX IS A RE-CHARGEABLE ONE. DO NOT REPLACE IT WITH A DRY CELL BATTERY. Control box - with integral re-chargeable PP3 battery and 10-way socket that can be disconnected after installation for testing/fault finding. The control box must be mounted just inside the door of the caravan. Then the owner can insert the key into the key switch to turn the alarm ON / OFF from just outside the caravan. PIR head - that should be fitted at eye level "looking across" the caravan’s interior. Fit on the same side as the caravan’s door. This will prevent the owner from triggering the alarm when switching the alarm ON / OFF. Avoid fitting where it "looks" straight at a window. Ensure that the 12Volt leisure battery is disconnected, the mains hook up is disconnected and the 12S plug is not plugged into a tow vehicle (or test box). It’s well worth spending a few minutes deciding where to fit the alarm system’s components. Often wiring can be run at the back of bed boxes and cupboards, which saves drilling through the floor and working underneath the caravan. The wiring diagram shows how the system is connected. This is built into a standard double socket box. It mounts into a suitable cut out in the furniture just inside the main door. Remove the 2 securing screws from the front panel. Carefully lift the front panel up to expose the circuit board. Press the sliding clips on the sides of the box until they hinge inside the box. Insert the 10-way plug into the socket on the base of the box. Now insert the box (correct way up) into the cut out then press the sliding clips outwards until they "click" into position. Place the front panel onto the box, insert and tighten the two securing screws. Make sure that you do not trap the key switch wires. Finally, fit the two plastic screw covers into the fixing screw holes to hide the fixing screws. AVONDALE CARAVANS - this should be mounted at eye level in the front corner of the caravan and on the same side as the control box. The PIR will look across the caravan detecting an intruder, but not detecting the owner using the key switch to turn the alarm ON or OFF. NOTE - later model Avondales use a ceiling mounted PIR. Avoid mounting the PIR head where it is directly facing a window. Remove the front half of the case by undoing the single screw, then carefully hinging it down and off. Carefully remove the printed circuit board, which is secured by one screw. The PIR head is mounted using the pre-drilled holes in the base. Re-fit the printed circuit board, and then connect the three wires from the control box as shown on the wiring diagram. Refit the front half of the case and secure it with the single fixing screw. LUNAR CARAVANS - this should be fitted in the ceiling away from any heat sources. Remove the lens cover using a wide flat bladed screwdriver between the two case halves. Carefully remove the printed circuit board, which is secured by one screw. The PIR head is mounted using the pre-drilled holes in the base. Re-fit the printed circuit board, and then connect the three wires from the control box as shown on the wiring diagram. Refit the lens cover by aligning the "ears" then press firmly until the cover "snaps" into place. This should be fitted to a rear steady with the magnet fixed to the "in board" end of the spindle and the bracket assembly mounted adjacent to it. Rotation of the leg winder should cause the magnet to pass within a couple of milli metres of the sensor fitted to the bracket. Please refer to the diagram. 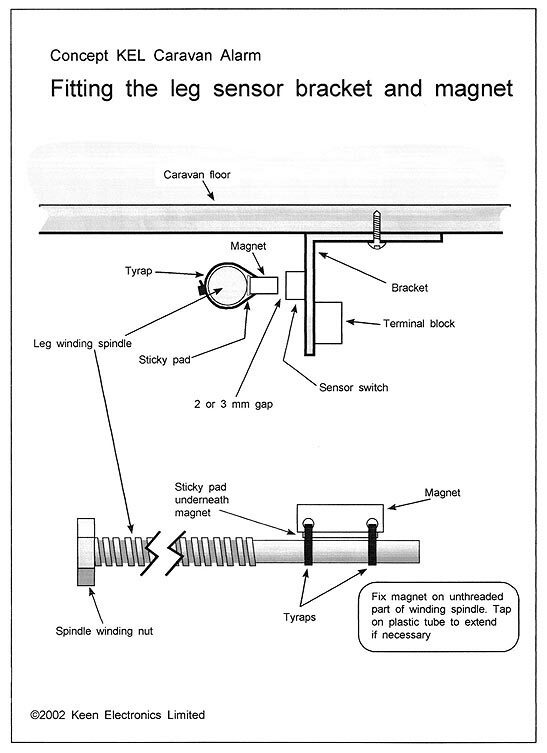 Clean any grease/road dirt off the part of the spindle that the magnet is to be fixed to. Then stick a double-sided pad onto the magnet, place the magnet onto the spindle then fix in place with the two tyraps. Tighten the tyraps with a pair of pliers - pull hard! Then cut off the surplus plastic from the tyraps. Mount the bracket onto the underside of the caravan floor, positioned so that the magnet passes within a couple of milli metres of the sensor fitted to the bracket. Finally, connect the two wires from the control box to the two used terminals on the leg sensor. 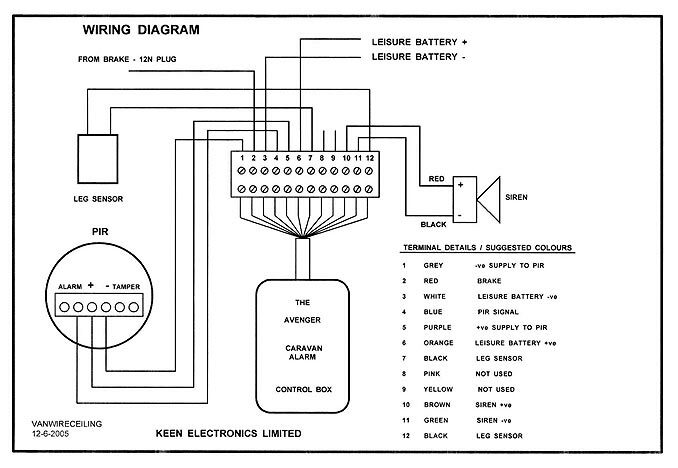 Please refer to the wiring diagrams at the end of the text. The early model Avondale Avengers used a wall mounting PIR detector. Later models use a ceiling mounted PIR . The second diagram is for the Lunar Avenger which uses a ceiling mounted PIR and later model Avondales. The connections to the PIRs are the only differences between the two wiring diagrams. Connect the leg sensor to the control box using twin flat loudspeaker cable, polarity is not important. Connect the siren to the control box using twin flat loudspeaker cable, observe correct polarity - red siren wire to siren + and black siren wire to siren -. Connect the PIR head to the control box using 3 or 4 core cable as shown in the wiring diagram. Locate a convenient point in the 12N wiring to connect to the BRAKE wire - usually red in colour. Finally, connect the 12 Volt supply from the leisure battery to the control box. Do not use twin flat speaker cable, as it is rather thin for this application. A 0.75mm or 1.0mm cable (24/0.2) or similar is recommended. In some caravans it is practical to connect these wires via the battery charger, but in others it may be easier to connect direct to the leisure battery (always through an in line fuse). Step outside the caravan, then reach inside and insert the key into the key switch on the control box. Press the key inwards and turn clockwise to switch the alarm ON, the siren should "cheep" twice then remain silent. The red LED on the control box will start flashing regularly. Turn the key anti-clockwise to switch the alarm OFF, the red LED will stop flashing. When the alarm is ON and the alarm is triggered the siren should sound for 2 minutes, unless switched OFF with the key switch. IMPORTANT NOTE –once the alarm has been triggered the red LED will stop flashing regularly and will flash a certain number of times, pause, flash the same number of times, etc. The Alarm Status table printed on the control box details number of flashes for each sensor. The LED will continue flashing when the alarm has been switched OFF with the key switch. The LED will revert to normal regular flashing when the alarm is next turned ON with the key switch. Turning the alarm OFF will then stop the LED flashing. This feature is useful to advise the owners if the alarm has been triggered in their absence and for fault finding (especially intermittent false alarms). With the alarm ON any of the following actions will trigger the alarm. Coupling up and inserting the 12N plug will trigger the alarm. If the alarm is left sounding, with the 12N plug still inserted, after the siren stops (2 minutes) operation of the footbrake will re-trigger the alarm. With the caravan coupled up and the 12N plug inserted, removal of the 12N plug will trigger the alarm. If the re-chargeable PP3 battery is charged and the alarm switched on, disconnection of the 12V battery will trigger the alarm.